Over easter; BMW invited me to Seoul to stretch the legs of their M-Sport range on the tarmac of its Driving Centre in Incheon, South Korea. It was a once-in-a-lifetime opportunity that I sure wasn’t going to ‘passover’! For those of you that don’t know, here’s a brief history lesson. Officially founded on March 7, 1916, BMW (Bayerische Motoren Werke GmbH/Bavarian Motor Works) has come a long way in its 100+ years. Originally an aircraft engine manufacturer, its first automobile (the Dixi) rolled off production lines in 1927. This (Austin 7-based) 4-cylinder 747cc/11kW powerhouse came in body styles ranging from coupé, roadster, tourer and sedan, but most cars left the factory as tourers. At first, the cars were badged as BMW Dixi but the Dixi name was dropped in 1929 when the DA-1 was replaced by a slightly updated version, the BMW3/15 DA-2. In the early 30s, the planets started to align for the company. BMW introduced a new car, the Wartburg DA3, which became BMW’s first sports car, and in 1933, the company manufactured the 303, a family sedan and the first BMW to sport the famous kidney grille. By the 1950s, BMW re-entered the automobile field and introduced the 501, the first post-war BMW. The mid-50s saw BMW buying the rights to manufacture the Italian Iso Isetta and in 1954 the BMW 502 V8 Super made its debut. This popular mid-sized luxury car really enhanced the company’s reputation globally, quickly assisted by the glorious 507. With the introduction of the 3200 CS, 1500, 2000 (including the 2002), E9 coupe and E3, the 60s were an incredibly successful time in BMW’s history. In fact, the company became so popular the Munich plant couldn’t handle consumer demands, so in 1967 they shifted to a new location with a larger plant in Berlin and began production of motorcycles. Although actually established in 1972, BMW M GmbH (M replacing Motorsport) has seemingly always very much been an integral part of BMW’s DNA – they just finally gave it a title. Initially created to champion BMW’s racing program (which was very successful in the 60s and 70s), M’s first racing project was the 3.0CSL – a car that did well on the track (particularly in Euro Touring) and helped grow interest for performance vehicles with the roadfaring people too. The first official M-badged road car for sale to the public was the (barely domesticated) race car, the M1, which was revealed at the Paris Motor Show in 1978. With its shark-nosed good looks and mid-engined power, this ‘driveable’ sports car truly straddled the divide between track and road. However, a decline in the demand by the public for the exotic meant the direction of the M cars had to change, and so came the 1979 release of the M535i (which was a high-performance version of BMW’s popular 5 Series mid-size sedan) followed by the M635 CSI in the early 80s. Since then, the M badge has found its way onto a large proportion of BMW’s production cars, and even (with the recent introduction of turbos) found its way onto previously ‘un M-badgeable’ models – and therein caused a ripple of confusion. In a colourful presentation that included the brand’s history and current full range (I’ll get to that in a moment) was a slide reminiscent of Maslow’s ‘hierarchy of needs’, which explained M positioning perfectly. 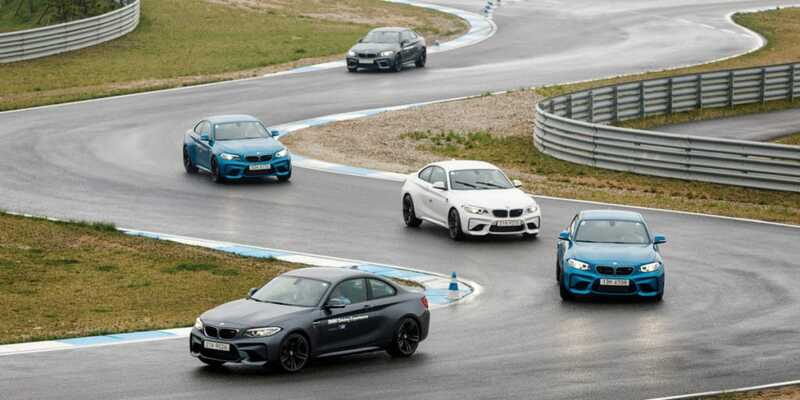 At the foot of the ladder lies the core car, (for example, the BMW 2-Series Coupe), with the M options and packages sitting above – essentially the same power but sportier trim (BMW 2-Series Coupe with M Sport packaging). Climbing further north, you’re into M Performance territory – greater power and torque, better handling (M240i Coupe) before the final jump from needs to want, up to M – again, more power and torque and maximum performance (M2 coupe). M cars are much more than a badge. It’s in their design: inside (M Sports seats, M-specific head up display and instrumentation) and out (large front air intakes, M rear aprons with chrome-plated twin tailpipes, light alloy wheels and carbon roofs). It’s in their mechanics (high-performance engines and controls, M-specific turbos, carbon ceramic brakes, M chassis) and it’s in their soul – there is an indescribable feeling of inner confidence when you plant your foot down hard on the accelerator. The current M line-up is M2, M3 sedan, M4 coupe/convertible, M5 sedan, X5M, X6M, M6 coupe/gran coupe/convertible and, as it turned out, we were luckier still to be the first to witness the unveiling of the new M4 CS. In a very clandestine ‘frisked for your recording devices’ event, Peter pulled back the silk on the San Marino Blue Metallic M4 CS. It’s a stunning looking car that sits snugly between the sporty luxury of the Competition Package and the ferocious GTS – making it a more livable high-performance vehicle. Under the carbon fibre bonnet is a 3.0-litre engine with a power output of 343kW; the state-of-the-art M TwinPower Turbo technology allows it to dip below the four-second mark for the 0 to 100km/h while the top speed is electronically limited to 280km/h – my ‘needs and wants’ went off the chart. 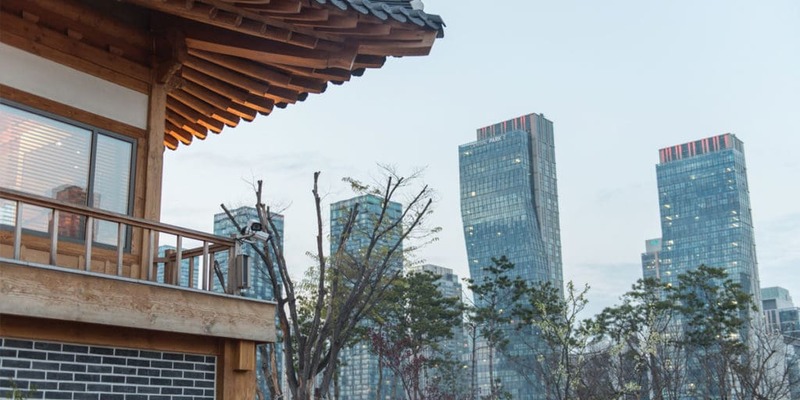 From an informative and interactive creche (where children can learn how suspension and braking works, make imaginative cars and pedal vehicles on a custom-made track), to a world-class restaurant, it is a very impressive facility. You can drool over the latest and greatest from the BMW brands (plus a few classics to paw), it can be the venue for your new car unveiling or you can even get married there – hmmmm… well worth consideration. Exercise three was a timed gymkhana that included slaloms and donuts – for this, we returned to the M2 and let the wheels really spin. It was meant as a handling test for the various driving modes, but I opted to avoid Normal and head into Sport and Sport+ territory. The M2 dashed down the course with ease and dabbed between the cones as a minor inconvenience rather than a chore. In Sport, the rear end failed to step out around the donut, but this was rectified with the flick of a button to +. My times were getting better and even very respectable, but given the choice of a better time or letting loose on the last run, my inner demon ran amok – the course became a smoke and squeal-filled run – the M2 did the same! 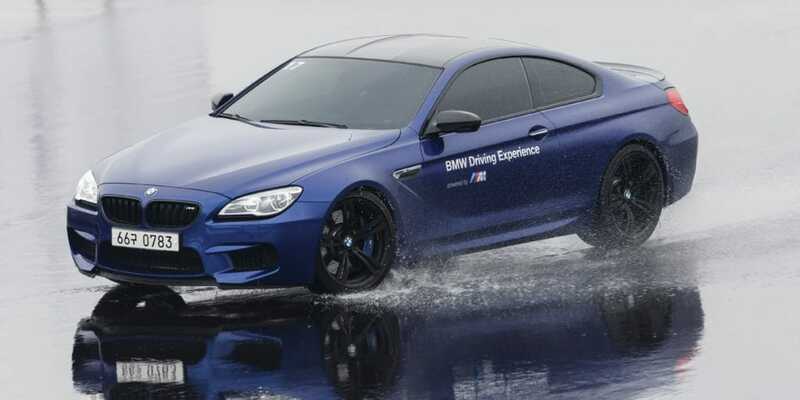 The last exercise was a wet road slalom and emergency stop/steer, and for this I was handed the keys to the M6. 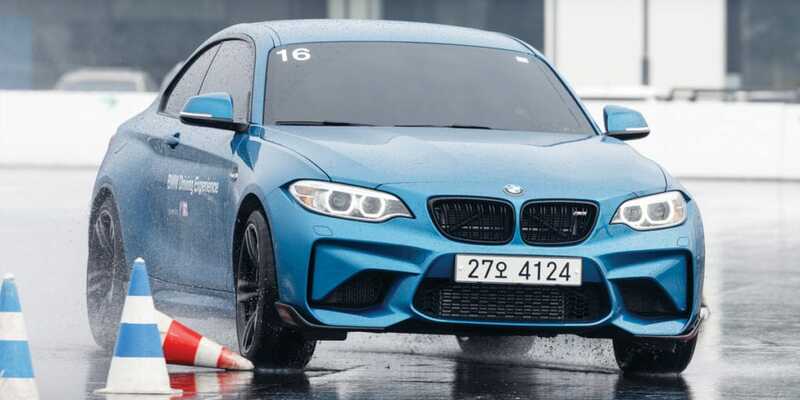 The course was laid out with an opening straight, a road-cone slalom, another straight with a flowing 180 turn and finally an emergency braking manoeuver through a chicane to a complete stop – all on sodden tarmac. I haven’t driven this GT before and my first impression was that she’s a big girl, but powerful too. Off the line she wagged her tail as traction was searched for. My poor driving skills ensured that a big understeer followed as the cones were… ahem… ‘negotiated’ – my braking/control was good though. My second run was a little more calculated and by the third, I had it down pat. It surprised me how easy such a large car handled the wet weather scenario. With all the exercises completed, and drivetime over, we headed to the restaurant for a full-on feed – contentment ensued quickly after.